It has been awhile since I have added an entry to my blog. The past four months have been very busy, and blogging has been the last thing on my mind. But while in Calgary last week, several friends said they missed reading my blog, so I vowed to start writing again. 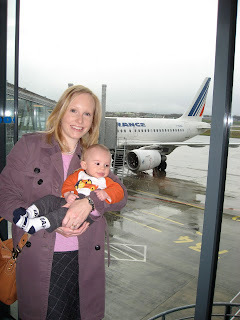 Although I am not sure life with a baby is as exciting to read about as my past traveling life was! 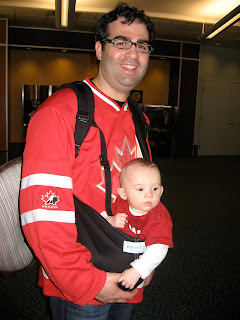 Speaking of traveling, we have just returned from our first big trip with child. We were seasoned travelers before Xavier was born. We each had our own roles in planning a trip. Packing was a cinch-everything having its proper place in the suitcase. But throw in a baby with toys, diapers, and unpredictability, and the old rules are thrown out the window. Before going, we had a million questions: how will Xavier adjust to the nine-hour time difference in Vancouver? Will we ever get to sleep if we're up with him all night? 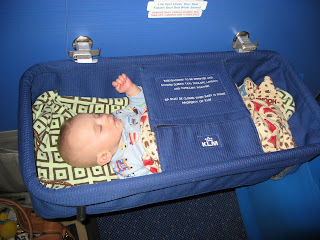 Will we be the hated parents with the howling baby on the plane? But we need not have worried. Xavier was a great traveler, and we did a good job adjusting our usual travel pace to meet his needs. The return trip did have its challenges, though. Xavier decided to poop through two outfits, and on our friends’ towels just as we were rushing out the door to head to the Calgary airport. While Gilles was dealing with the mess, I searched through the packed bags for more clothes for Xavier. Then, upon arrival in Pau, our luggage did not make it and our car had a dead battery. Not what you want after 20 hours of traveling! But all in all, they were only minor glitches during a wonderful two week vacation. I did miss your blogs!!! I still checked it all the time with hopes of a post!! I know I could just email, but the blog is so much fun.